Plenty of major leaguers have homered in their first at-bat. Some even hit a grand slam. But in the post-1950s baseball card era, only three players (two pitchers and one catcher) have homered in their one-and-only plate appearance for a franchise. 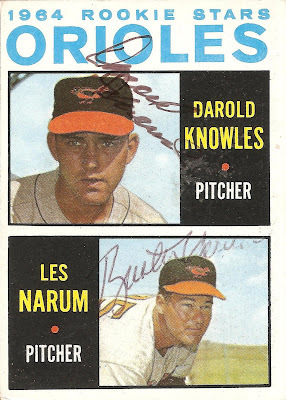 The first guy to do so was Les "Buster" Narum, who pitched several games of middle relief in 1963, but only came to the plate once as an Oriole, facing Detroit starter Don Mossi on May 3 (box score). Don started the 4th inning up 3 runs, but plunked leadoff hitter Jerry Orsino and then gave up Buster's Baltimore bomb, narrowing the score to 5-4. 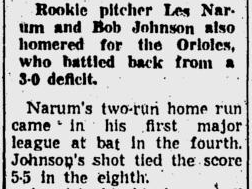 Scoreless relief pitching and 9th-inning homers from Luis Aparicio and Joe Gaines completed an 8-5 win; the Pittsburgh Post-Gazette included a note on Narum's debut in their May 4, 1963 sports report. 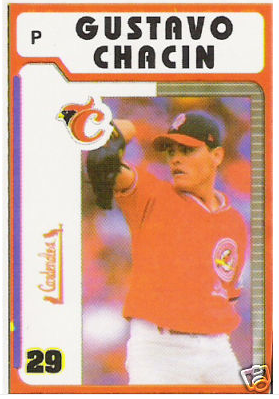 Next up, Venezuelan native Gustavo Chacin, who slugged his one-franchise homer during a 2010 stint with the Houston Astros, taking Luis Atilano deep to right in the 3rd inning of a 14-4 blowout (May 31 box score). It's also his only MLB hit to date. Thanks to interleague play, Gustavo batted 8 times for Toronto in 2005, but never reached base safely. The Baseball-Reference blog noted Gustavo's 1AB/1HR achievement in Chacin's Perfect Season. He's a free agent and only 31, so could bat again for Houston someday and drop himself off this list. Current Cubs bench coach Jamie Quirk wore several uniforms during his 18-year career, but played exactly one inning of one game as an Indian during the heat of 1984's pennant race. And it was the biggest inning of the three mentioned in this post. Jaime's moment in the sun began with Cleveland's 8th-inning rally. Starting catcher Jerry Willard singled in their first run, but yielded to pinch-runner Tony Bernazard. Out of other options, Quirk caught Cleveland's top of the 9th and batted third in the bottom half, with the score tied 3-3. 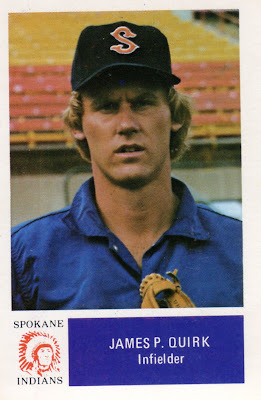 Their apparent best hopes (George Vuckovich and Pat Tabler) both struck out, but Quirk made everyone forget it with a two-out, walk-off homer versus Minnesota closer Ron Davis. It'd be his only appearance in a one-week run as an Indian; they released him on October 1, after the season ended. 1 Team/1 AB/1 HR is one of my favorite stat oddities, discovered in part because I keep a collection of Mr. Quirk cards. Any special stats you track for your player collections? I have always loved that little "quirk" about Quirk, I was unaware that only two others had ever done it. Very cool. It's not exactly stats, but along these same lines, I do like to have cards of players who spent long times with one team and only one year with another. Not just someone like Dewey Evans, who spent his last year with the O's after a career with the Sox, I like players like Reggie Jackson or Mike Piazza, who spent one year (or in Piazza's case, 5 games) with a single team in the middle of a career. Gorman Thomas is another good example of this. Quirk is super nice, too. I was on the field and he agreed to do a quick interview, just as my photog's video equipment zonked. I told Quirk I'd be in Houston in a few weeks and I would try to catch him there. In Houston, I barely approached him and he remembered and we did the interview. Great post! My favorite blog posts are the ones I walk away with interesting trivia. At one point I was trying to get autographs from every person who had hit 100 home runs in both the minor leagues and major leagues. Given that about half of them are deceased, I hung up the project. Thanks and those are cool collecting ideas! Too bad the 100/100 homer thing turned out to be a non-starter. Maybe set an expansion-era cutoff of 1969? btw, over at WGOM.com, we refer to Davis as He-Who-Shall-Not-Be-Named. I can't tell you how many games he blew that I was in attendance. 'scuse me while I go wipe my eye.